This page covers some of the essential points you'll need to know about driving in Germany as well as basic information about renting a car. Renting a car in Germany (Mietwagen, Leihwagen) entails pretty much the same process as in the US. Most of the major US and European car rental agencies are represented in Germany including Avis, Hertz, Budget, Alamo, Sixt, and Europcar. 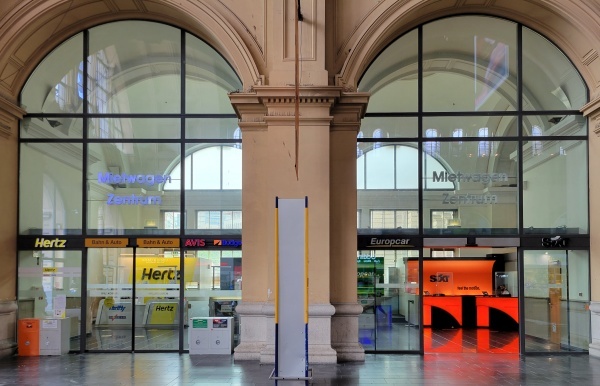 Rental cars are available at all airports and many major rail stations and other city locations, although you'll often pay more for the convenience of the latter. For Americans, the best deals are usually available by booking with a US firm before departure. You will not only get the best rate, but it will be set in US dollars. You will need to book these at least 14 days before you plan to pick-up the vehicle. Rental rates vary considerably between the various companies, but all are fairly competitive. Call around or check the web to get the best rate. Alternatively, you can use a consolidator service like AutoEurope. Once you find the best rate and firm-up your itinerary, reserve right away to ensure you get a vehicle. Note that base rates do not include the 19% Value Added Tax/VAT (Mehrwertsteuer/MwSt), registration fee, or any airport fees; expect those to equal 25% or so of the daily rental rate. Rates do, however, include the required third-party liability insurance. To rent a vehicle, you will need your driver's license and passport. If you're coming from the US, UK, or Austrailia, you generally will not need an International Driving Permit (IDP), especially if your driver's license is in the internationally-recognized numbered format (i.e. each bit of information on your license is numbered); from other countries, check with the German embassy or consulate or the rental car agency before leaving home to determine if you'll need an IDP. As mentioned, your rental car contract includes the required third-party liability insurance. This means the rental agency will pay any claims to other parties in case of an accident. However, you are responsible for any damage to or theft of the rental vehicle. Just like in the US, rental agencies offer their own damage waiver (CDW or LDW) that you can purchase when you rent the vehicle. These can be pricey, but give you the peace-of-mind of knowing that (with a few exceptions) your liability should something happen to the car will be minimal. Be sure to read the fine print and understand what the waiver covers, what it costs, and what your responsibilities are. If you don't want to pay for the damage waiver, check with your credit card companies. Most offer built-in coverage for free. Again, check the fine print of the coverage to understand what it covers, what you have to do to activate the coverage, and how to make a claim should you need to. Also realize that many times, you have to cover any charges from the rental company for damages first and then the credit card company will reimburse you some time later. Finally, there are coverage options through third-party travel insurance providers. You can find these on the Internet. Once again, be sure you full understand what's covered, how much it costs, and so forth before purchasing. European rental cars generally come equipped with a manual transmission (the word "standard" really does apply here.) If you want (or need) an automatic, make sure you specify this when you book. It will probably cost extra, though. If you really want luxury, you may also want to inquire about renting a high-end German sports car or sedan; most rental agencies keep ample numbers of these available for those tourists with the desire and corresponding budget. Most car rental agencies will allow one-way rentals within Germany (pick-up the car in one city and return it at another) at no extra fee. If you want to do this, make sure that this is the case before you rent. Most rentals also allow unlimited kilometers. If you plan to travel outside of Germany, make sure that this is noted on the contract and that the vehicle is properly documented for international travel. Chances are, most agencies will permit travel to most other western European countries (Italy can be iffy), but probably not anywhere east of Germany except Austria. Electric and hybrid cars are now available for rental from most of the major firms. Every rental vehicle should have a green insurance certificate ("Green Card"). It is important that you have this before you drive off. If you are stopped by the police, travel to a different country, or have an accident, you will need to produce this document. Make sure that the vehicle has all of the required emergency equipment (warning triangle, first aid kit, spare tire and jack, and safety vest) and a parking disc. Also, verify what type of fuel the vehicle uses-- many German cars use diesel, which helpfully is the same word in German. Before venturing out on the road, make sure you know where all the buttons, knobs, and controls are. Take a little test drive around the lot to get a feel for the car. This will allow you to make any necessary discoveries or adjustments before you get out into the foreign driving environment where you will need to concentrate. If you have any questions, ask the lot attendant-- in my experience, they're more than happy to help. Gasoline (Benzin) and diesel (Diesel) are readily available throughout Germany, although filling stations (Tankstellen) are not nearly as prolific as in the US. Still, you should have little problem finding a place to "tank-up" (volltanken) when you need to. 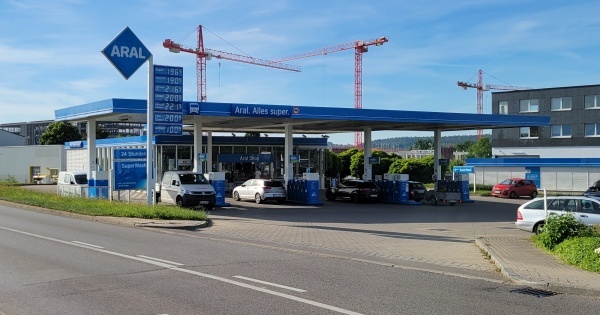 Most small towns have at least one station, and there are 24-hour stations and truck stops located at intervals along the Autobahn and major highways. The major brands are Aral, Avia, BP, Elf, Esso, Fina, Jet, Total, and Shell. Most stations are now self-service (Selbstbedienung, or SB-Tanken.) Like the US, unleaded fuel (bleifrei) is now the norm. Pumps in Germany work basically the same as in the US. Europe uses a different formula to calculate octane ratings, so the scores will appear to be higher than those for corresponding grades in the US. Also, remember that fuel is dispensed by the liter. Americans will likely experience "sticker-shock" when it comes to gas prices in Germany. Expect to pay three to fours times more for gas in Germany than in the US. As of January 2017, regular unleaded averaged €1.35 per liter (or about US$6.35 per gallon) and diesel was about €1.17 (about US$5.50 per gallon). Most of this cost is due to high taxes. See the "Other sites of interest" below for links to a sites with current fuel rates. LPG (Autogas) is widely available in Germany. Nearly half of all filling stations have LPG available. CNG stations are much less prolific with less than 1,000 nationwide. After a slow start, Germany has dramatically increased the number of charging stations (e-Tankstelle) in the country over the past few years. As of 2016, there were about 7,400 electric car charging stations around the country with the government and carmakers pledging to help build more. Germany has a couple of major automobile/motorists clubs. The biggest is the ADAC (Allgemeiner Deutscher Automobil Club, General German Auto Club). The other is the AvD (Automobilclub von Deutschland, Auto Club of Germany.) Both offer the usual array of motorist and travel services. 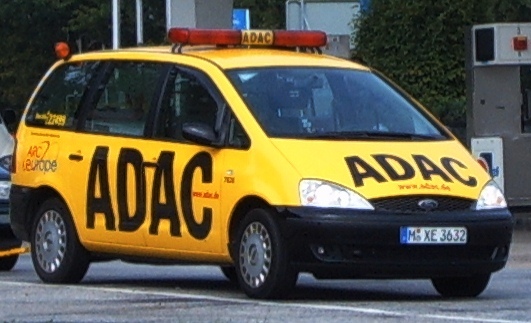 Of most interest to the tourist is the roadside breakdown service (Straßenwacht, Pannenhilfe) operated by both clubs (most especially ADAC), which offers assistance to both members and non-members. In fact, ADAC claims to provide assistance every eight seconds and can repair the vehicle on the roadside more than 85% of the time. Basic help from these "yellow angels" is free, but you will have to pay for parts or towing. To summon help on the Autobahn, use the nearest emergency telephone, located at 2 km intervals; arrows on the roadside posts will direct you to the nearest one (see the "Emergencies" section of the Autobahn page). On other roads, call 0180-2 22 22 22 from a phone booth or mobile phone. If you are using a rental car, contact the rental agency for assistance. German maps are, like most other things Teutonic, excellent in quality. The best maps are from Hallwag (the German franchise of Rand McNally) and the ADAC auto club. The RV Verlag Euro-City series of city and metro maps is excellent (each map seems to be almost as big as the city itself!) Michelin also publishes a competent collection of regional and city maps. Even the free maps available from tourist offices tend to be more than adequate in scope and detail. Licensing, traffic and parking laws, and signs and signals are covered in detail the traffic laws and signs and signals pages. Germany has the world's 12th largest road network-- pretty amazing for such a compact country. There are 644,480 km of roads, with over 225,000 km of this total being trunk roads and highways including about 13,000 km of Autobahn and 40,000 km of Federal Highways (Bundesstraßen), providing paved access to even the most remote corners of the country. These roads carry a huge and growing volume of traffic. In 2015, there were over 62 million registered vehicles, up from 55 million in 2009, 36 million in 1990, and just 17 million in 1970. In addition, Germany serves as the crossroads of Europe funneling much of the continent's east-west and north-south traffic. You will find that the roads in Germany are well-engineered and maintained; rarely will you find a pothole, and snow removal is almost instantaneous. Signage is uniform and comprehensive. To put it succinctly, Germany's roads are first class. One note about the road system: most of the roads in the former East Germany have now been rebuilt or upgraded from their previously dilapidated condition. Unfortunately, the expense of doing this has resulted in delays in maintenance and expansion of roads in the west. Still, the overall quality of the road system is excellent. Roads and streets in Germany and in Europe in general tend to be much narrower than what Americans are used to. That is one reason (along with high gas prices) that small vehicles are the rule here. City streets (Straße): All town and city streets are paved, sometimes with cobblestones. Generally in good repair. Frequently narrow with tight corners, but usually with enough room for two cars to pass. Usually named (although signs may be hard to find at times.) Variable traffic. Community link roads (Gemeindeverbindungsstraße): Two-lane roads connecting villages and smaller towns. Usually well-maintained. Generally light traffic. County roads (Kreisstraße): Two-lane roads connecting small and medium-sized towns. These roads have official numbers starting with a "K" or with the official county code. Occasionally these numbers may appear on guide signs or maps, but usually not. Universally well-maintained. Light to moderate traffic. State roads (Landstraße or Staatsstraße): Very similar to county roads. Usually connect larger towns. Again, these roads have official numbers (usually four digits) starting with an "L" or "St", but these numbers do not usually appear on signs. Universally well-maintained. Moderate to heavy traffic. Federal roads (Bundesstraße): Somewhat larger and usually significantly busier than state and county roads. The routes are numbered with "B" numbers (e.g. B35) and marked with federal highway signs. These roads are usually two lanes but frequently, especially in cities and busy tourist areas, they may have four or more lanes. In larger cities, they are often expressways (Kraftfahrstraße, Schnellstraße), or so-called "Autobahn-similar" (Autobahnähnlich) or "Yellow Autobahn" (Gelbe Autobahn) roads, marked with expressway signs. Federal roads connect large towns and cities and tourist areas. Universally well-maintained. Generally heavy traffic. Motorways (Autobahn): See the dedicated Autobahn page. European Highways (Europastraße): These aren't separate roads, but rather are co-designated with other highways, usually Autobahns. The European Highway System, with routes designated with an "E", provides for continuous numbering between countries, regardless of domestic route numbers. For example, near Saarbrücken, the German A6 crosses into France and becomes France's A32. However, both roads carry the E50 designation making it easy for international travelers to follow the route. European Highways are marked with the European Highway sign. Germany has over 80 themed highways for tourists. 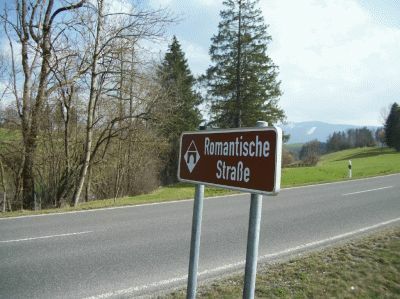 Perhaps the most well-known is the Romantic Road (Romantische Straße), a 180-mile route through small, picturesque Bavarian villages from Würzburg to the foothills of the Alps at Füssen. 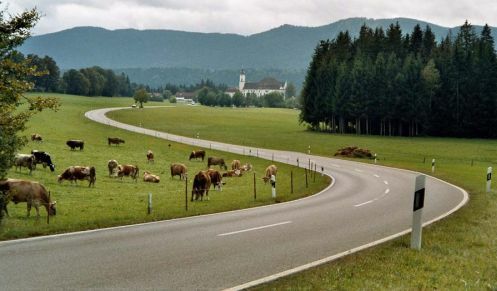 Other popular routes are the Castle Road (Burgenstraße) from Heidelberg to Nürnberg, and the Fairy Tale Road (Märchenstraße) from Frankfurt to Hannover. While guided bus tours are available along most of these routes, the best way to see them is by driving yourself. The routes are well-marked and information is available at every town along the way. If you do choose to travel one of these routes, plan to do so outside of the prime tourist seasons to avoid the crowds and get the best hotel and restaurant rates.